1. From a general viewpoint, having a 2-8 Microinch Finish (or a mirror finish) will improve die performance. As you look into each application of a carbide die, you’ll find that a well polished die will give all around consistency to it’s usage. And, taking time to polish a die will save your company stress when a die wears at an unpredictable rate. 2. Polishing will prolong the life of the die. There are many variables that play into this point. Strengthening the surface of the die with a greater micro finish allows it to handle greater pressure and resistance, eliminating some of the variables that shorten die life. 3. 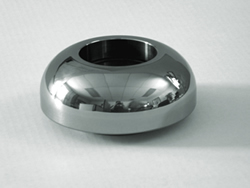 If you are looking for a uniform final product, you must keep the surface finish of your die in mind. Having a non-finished part will yield inconsistent results as your product moves through the manufacturing process. (i.e. curved tubing, varying wall thickness in aluminum cans[link to can tooling page], shearing, etc.) Taking your surface finish seriously will help to eliminate these inconsistencies in your final part. 4. In the same way you can control an inconsistency in your final product, you can also establish greater control over the wear of your carbide die. As a die comes to the end of it’s cycle, failing can be less drastic and therefore easier to correct or replace. The last thing you want to deal with is the extra expense of a die failing prematurely. Polishing your die well adds another element of control to your production. 5. The 10 to 1 rule plays into surface finishes on final products as well. So, when looking to have a strong final product, make sure your carbide dies have a far better finish.